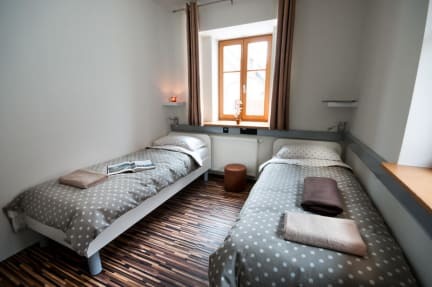 Cube Central Rooms for 2 is completely renovated historical Ljubljana townhouse. Located in an picturesque pedestrian area in Krakovo district. Should you visit, you will have a pleasure of being surrounded with green gardens, historical urban architecture and Ljubljanica river with its many cafes and pubs. Cube Central is only minutes away from all main Ljubljana's attractions: Prešeren square, Congress square, Triple Bridge, Cobbler's bridge Ljubljana Old Town, cultural center Križanke and Ljubljana Castle. We offer cute rooms with air-condition, safety deposit box and a free Wi-Fi internet. All rooms have access to shared bathrooms, kitchen and lounge areas. Housekeeping, linen and towels are included. Reception in ART Hotel is 380 m from CUBE on address Soteska 8. 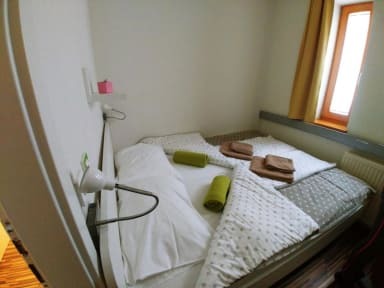 City tax (3.13€ /person/night ) is not included in the room price.